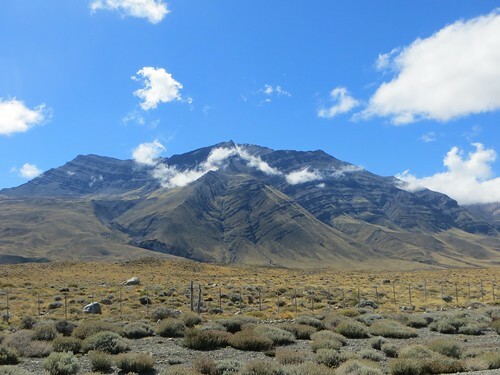 The Andes separate the countries of Chile and Argentina; the rain from the Chilean Pacific coast is not able to pass over the mountains and therefore the land to the east, Argentina, is dry, open and barren; it is called the pampa. In these such conditions the wind is king and we were at it’s mercy. This terrain was initially intimidating to me, but these feeling were dissolved due to the great company of Charmian (obviously) and three American cyclists, Matt, Lee and Seth. Sharing the road with these bright, warm shining lights I felt exuberant. 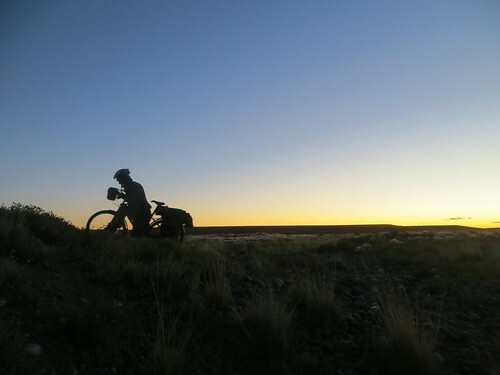 These were times of dusk wake up calls to ride in a drafting pack before the high winds struck, nightly hot chocolate rituals, singing the same Nickleback song incorrectly for a week, sharing, story telling and laughing constantly. 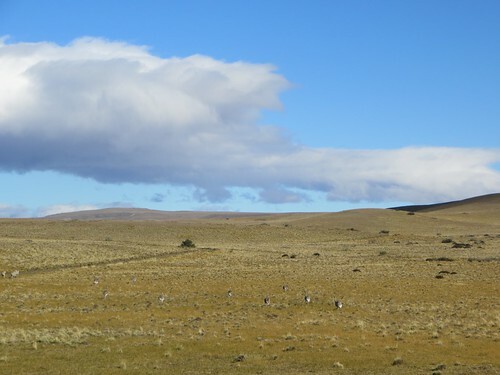 This was the bubble in which we lived, the 5 of us, for a week on the Patagonian pampa; the sense of collective spirit and the positive energy we gained in each others company was an incredible force and the time so rich and formative that it felt like much longer. Matt, Lee and Seth deserve proper introductions. Seth is incredibly clever, he is observant, practical and pragmatic, with a generous and kind spirit; he has a dry, almost British sense of humour. Matt hails from the Deep South and has a vulnerability that makes him an easy target for jokes, but in turn this makes him an engaging and loving character, he is keen to engage with others and debate, and is full of stories and positive words. 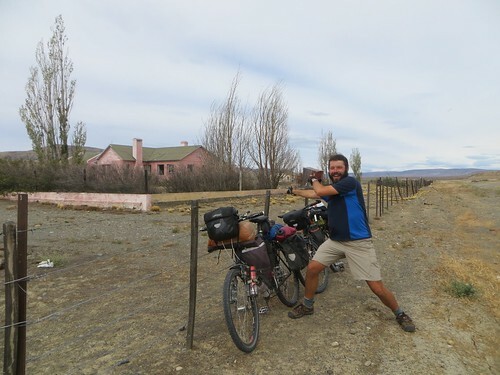 Lee has been named ‘Speedy Lee’ by other cyclists due to being a strong and efficient rider; he is an all round good egg who seems so at ease and joyful in his bike touring life, he is funny, measured, wise and patient. The best things in life are not things, they are moments like these. 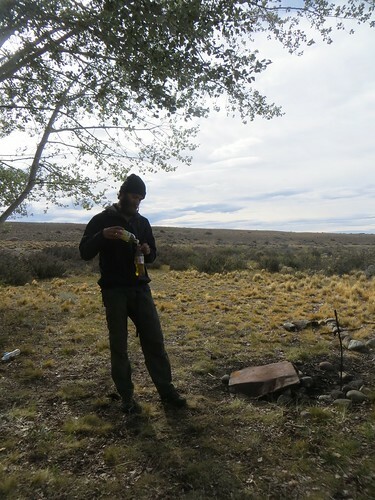 There were emotional goodbyes with Flor, a birthday cake to eat and my missing tent pegs to hunt for meaning that it was gone 2pm by the time we made it out of town. It was just Charmian and me, since the others still had various jobs to do. 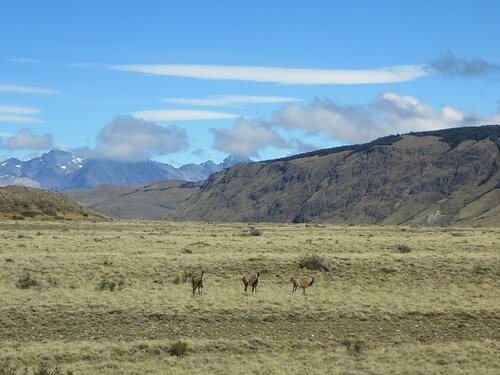 Our first sight of guanacos, the native Southern Patagonian wild camelid. 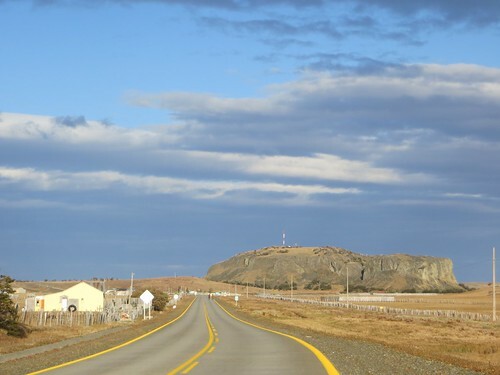 The landscape was a stark contrast from the Carretera Austral. 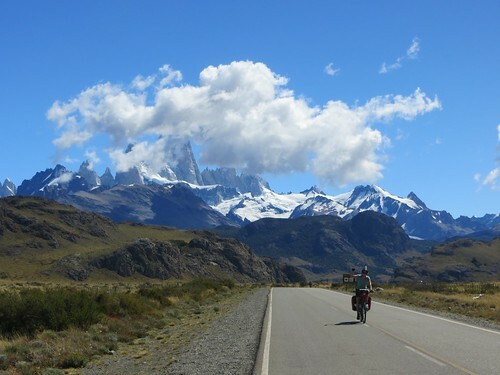 Cerro Torre and Fitz Roy remained on our backs for the 80km out of town. 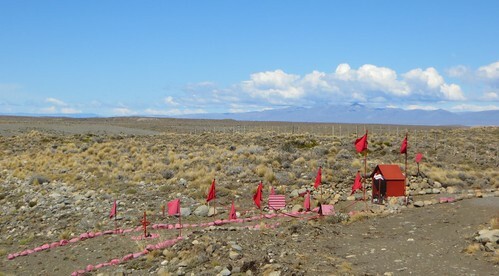 Gauchito Gil shrines a plenty. Charms attached her party hat to her helmet, obviously making her more aero dynamic. 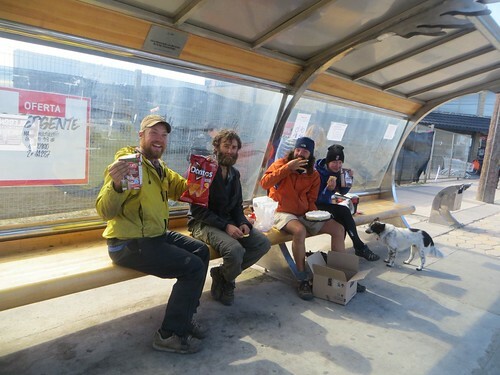 As we stopped to eat some food we saw some cyclists approaching, it was Lee and Seth. 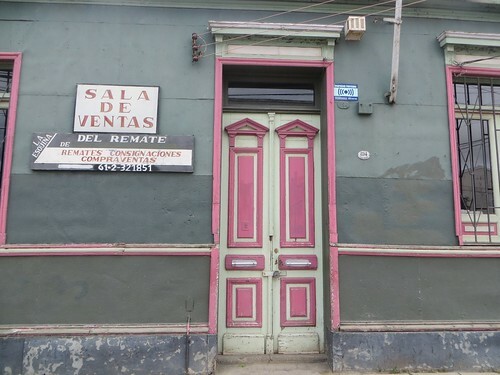 We had all left Flor’s house at different times with the idea of meeting on the road so we had not been sure if they were in front, or behind us. 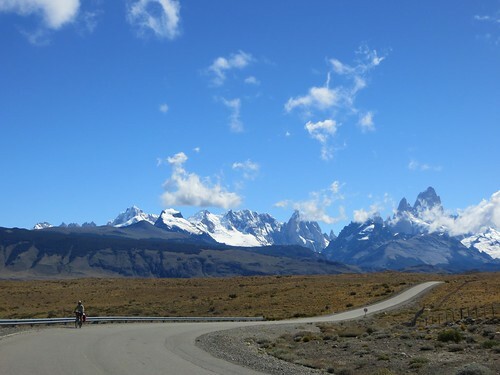 Leaving El Chalten came the realisation that these would be the final weeks of riding. 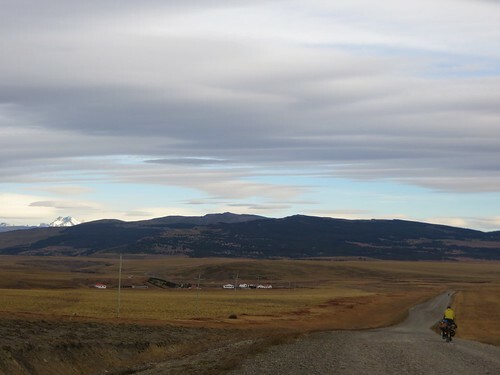 I wanted to take everything in, I stopped often to take photographs of clouds and the way the sun shines on the pampa. 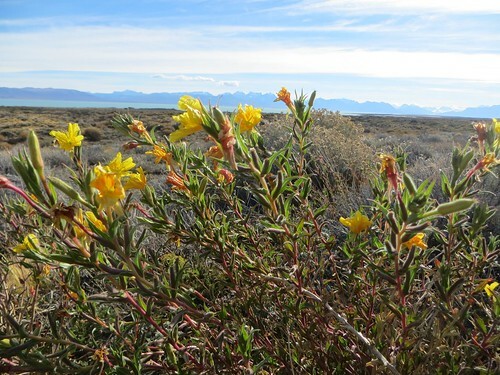 Pampa flowers. 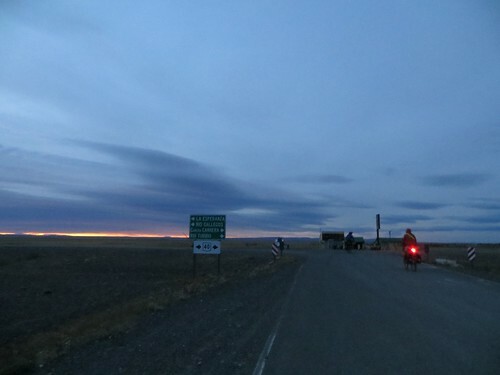 It is 87km to the junction that takes you back onto the ruta 40, we had hoped that strong tail winds would push us all the way there, these winds only showed up in the late afternoon to do their job. Lago Viedma at sunset. 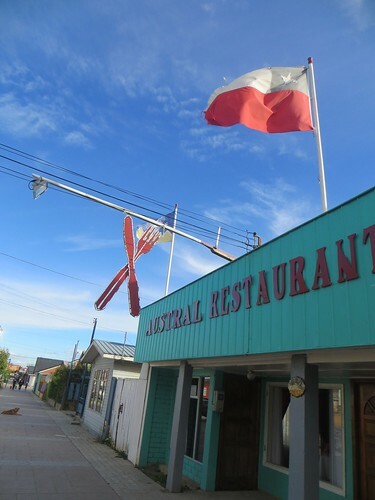 From the junction it is 23km to La Leona, a tourist restaurant. We had to make it there that evening to get water, those 23km with a strong side wind were tough. Seth and Lee were behind us at this point as they had stopped earlier to eat. Charmian and I had arrived at the hotel restaurant and the workers told us that it was a US$20 fee to camp. 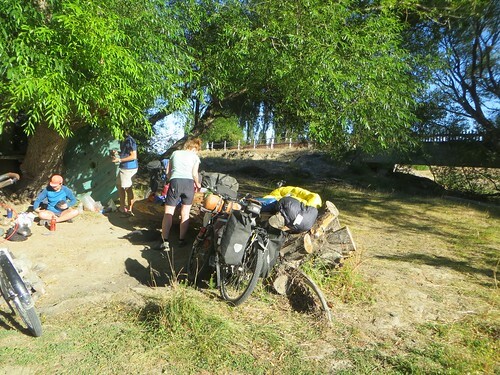 Instead they filled our water bags up and we crossed back over the river to camp in the trees. Back tracking on ourselves we bumped into Seth and Lee and went over to set up camp, the night was still and quiet. Here is Seth decanting some oil. We woke around 10am, as we had ridden until late the previous evening. Seth was recovering from some sort of sun stoke / exhaustion and was luckily beginning to feel better. It was a relaxed morning around camp. We finally got ourselves on the road gone 11am. 12km down the road we came to ‘the Pink House’ (Casa Rosada, in Spanish). 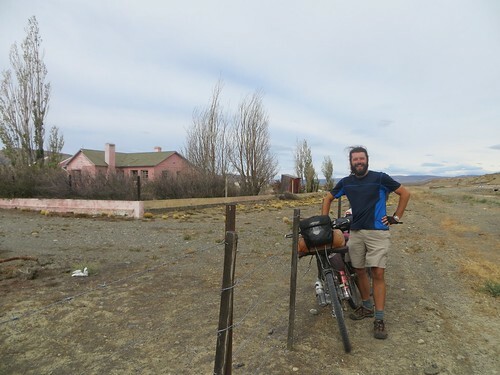 This place has become a cycle touring legend, we had read about it in blogs, and heard all the cyclists leaving El Chalten say that they were aiming to stay there. It would have been a good target for the previous day if we had left at sensible o’clock, but we hadn’t. 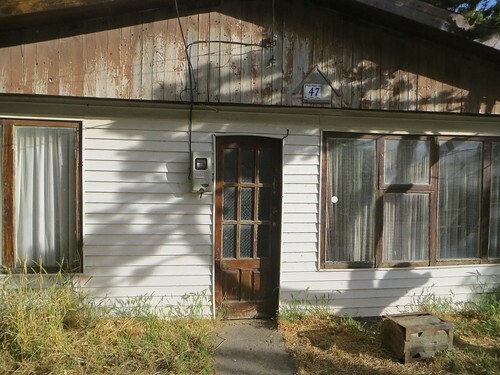 It is basically a derelict house with one room kept clean (there is even a broom inside) for cyclists to come and shelter from the wind, there is even a cyclists register on the wall. In this photo I’d said something to Lee to the effect of, “come on, pose outside the pink house, it’s a proper cycle tourist attraction”……. ….. I didn’t feel as though he was excited enough about ACTUALLY being at THE PINK HO– USE, so in the second photo I asked for some more enthusiasm. We make our way along a fairly quiet road, chatting most of the way. We stopped for some lunch at the side of the road. 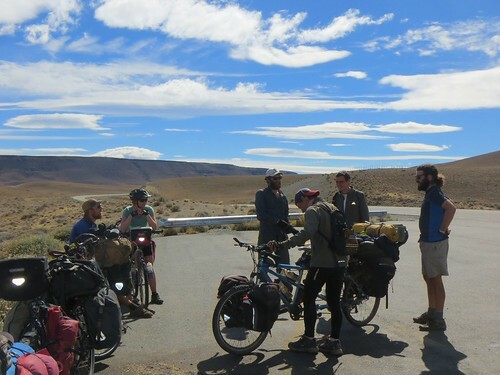 It was then that two Argentinians on a tandem cycled up and joined us, and shared around the mate. 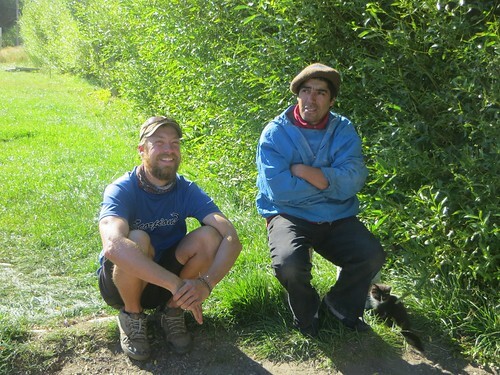 Then came Matt, he had left the casa del ciclistas at 5pm the previous day, and had got up early that morning in an attempt to catch us. He had also found my lost tent pegs. 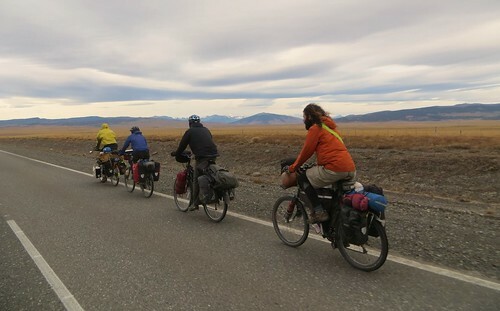 We rode as a group of 7 on 6 bikes for a few hours. 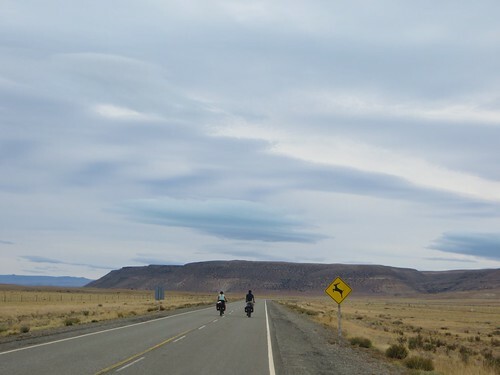 The Argentinians told us that they have been riding the whole length of the ruta 40. We shared stories about some of our experiences of the 40 further north. I asked them if they are still motivated, but they say they had had enough. 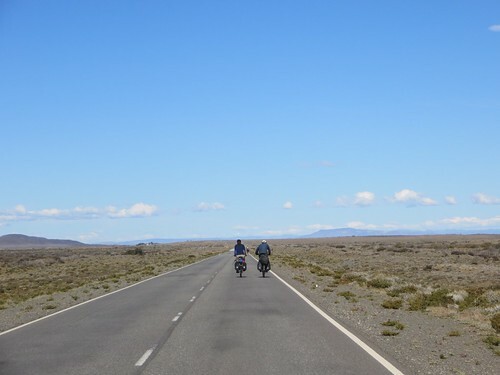 We had met a number of Argentinians who were riding the 40, it must take a huge amount of national pride to ride the whole length of that soul destroyingly dull road. 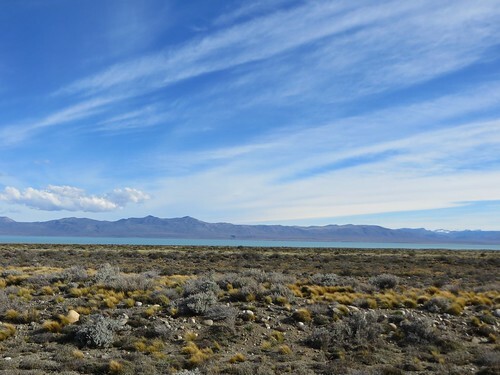 We stopped to look at views of Lago Argentino and chat some more. Those clouds! 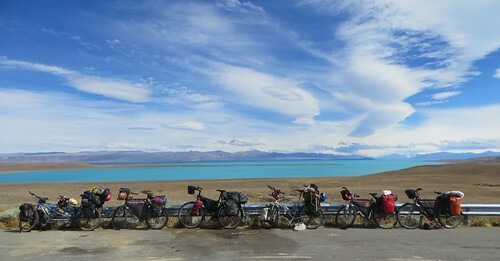 Oh, and Lago Argentino and those 6 bikes. I should also mention that the tandem had no brakes. We spent about an hour that afternoon either being chased or followed by a truck that had 30 metre long wire cables dragging along the back of it, which would snake out onto the road, with the potential of whipping us and other traffic. 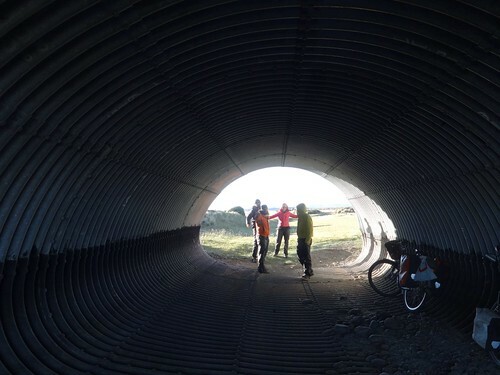 We lost the tandem riders at some point and took a break from the wind in this culvert. 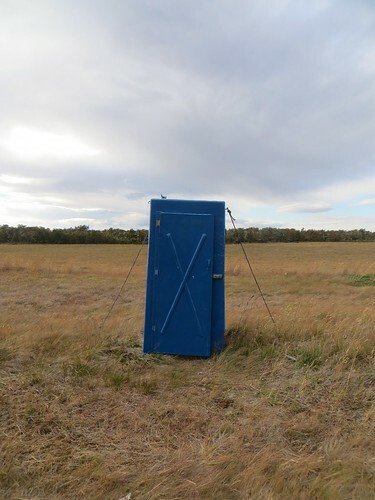 There was a shabby derelict house off the road that we inspected and found unsuitable, and a fancy red shipping container that we would have loved to sleep in, but was locked. Matt was pretty tired having woken up early and ridden a lot further, however, we decided to push on. 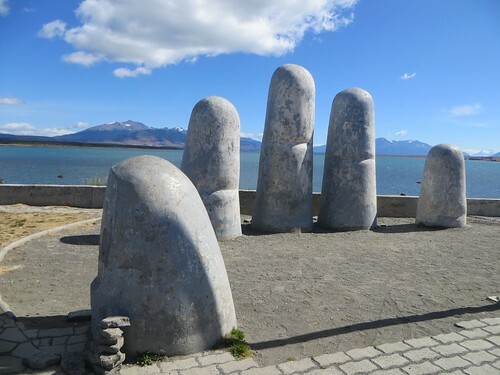 We came to the junction where you can turn off to El Calafate and visit the Perito Moreno glacier; Charmian and I had already decided that we were not going to visit; although it is one of the biggest attractions in the area we had felt sort of ambivalent about it, which we decided was not enough enthusiasm for something that would have involved a few days of detouring and a lot of money. A visit was not in the boy’s plans either. At the junction we had an insane tail wind, we were flying. 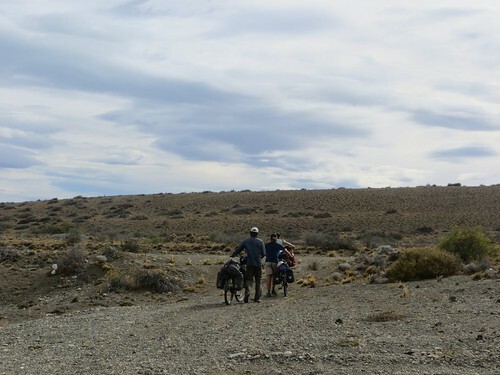 It was tempting to make the most of this wind and keep going, but instead we decided it would be prudent to stop around 9km after the junction at an estancia, as we were not sure what was ahead. 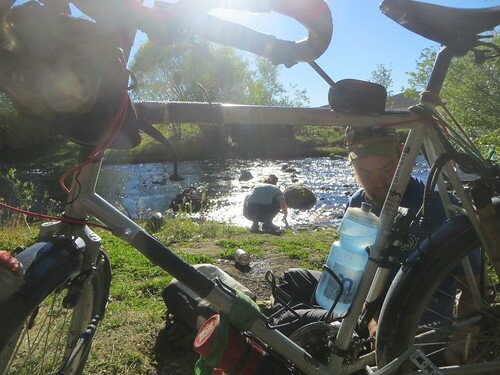 Luis, who lived on the estancia with his family had a little spot next to the river which he was happy to make available to passing cyclists. He had built a wooden wind guard around the trees making it a perfect camp spot, he had originally created the space for his children to play out of the wind. That evening started off with us singing pop punk songs badly. It then led to me finding some ‘On The Road’ quotes I’d saved on my phone and making everyone recite one each, and talk about what it meant and how it related to our travels. This sounds incredibly cheesy to my cynical British self but it was actually a beautiful moment, although I think Charms was a little uncomfortable about it. Another relaxed morning around camp. Luis welcomed us to use the shower in his home. About as exciting as the road got that day. The day started off with a climb with a tail wind. By the time we had reached the top of the pass the wind was insane and we took shelter by a small road memorial. 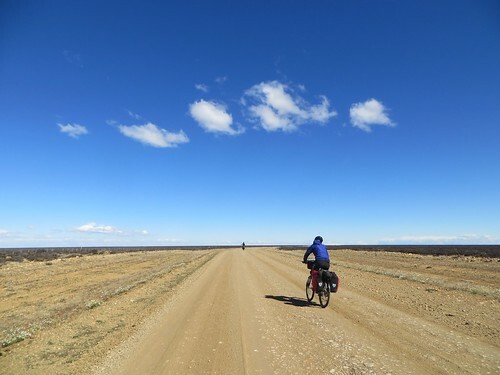 The stretch that followed was the most vulnerable I have felt whilst riding on this bike tour (aside from cycling into Mexico City). 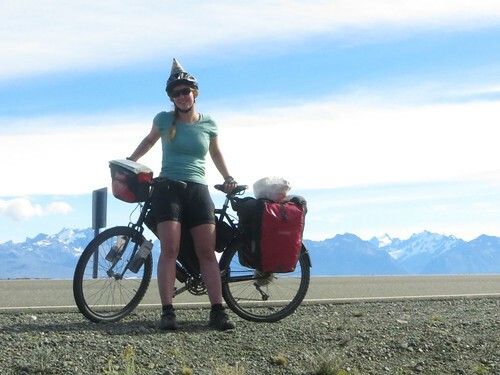 The side wind was so strong that it could easily push you into the traffic; Charmian and I preferred to ride on the hard shoulder, it was pretty exhausting to use all of your strength to steer against the wind. 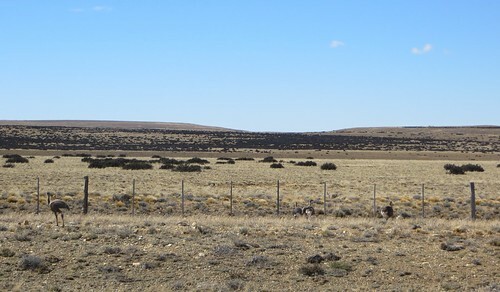 Ñandú, or Rhea, are large flightless birds related to the ostrich / emu and live here on the Southern Patagonian pampa. 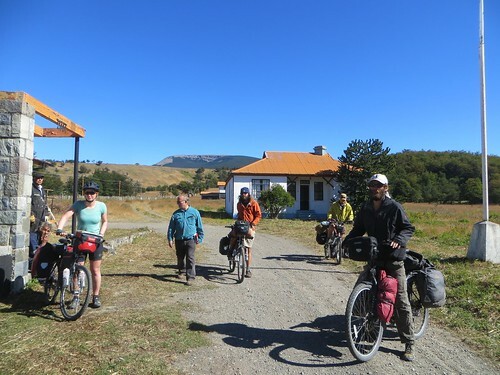 It was a huge relief to arrive in El Cerrito, a road maintenance point. 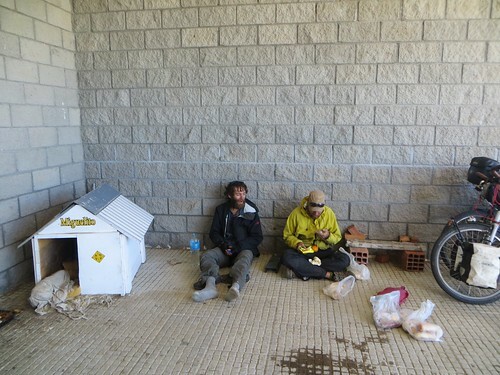 Seth looks homeless in this picture, sat on the floor next to the kennel of Miguelito the dog. 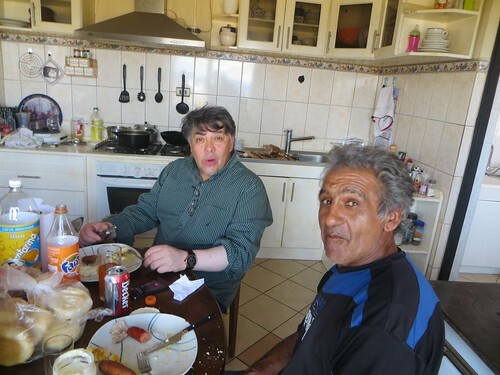 Here we met Mert and Claude (Denmark/France) who we had first met back in Coyhaique. 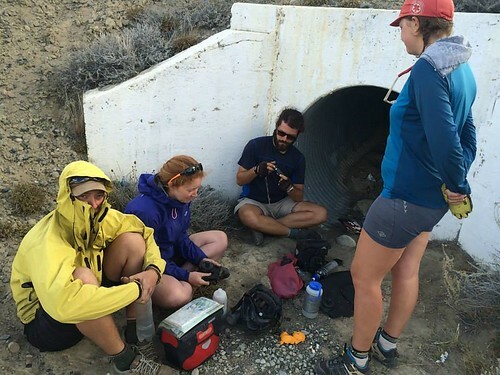 We deliberated for a while about what to do, whether we should spend the night at El Cerrito or continue into a strong wind, we decided to continue. This photograph looks so peaceful. 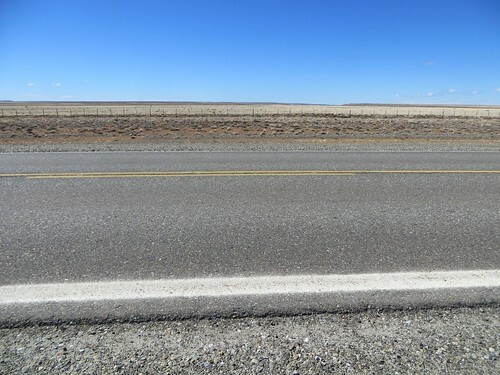 Here you could take the more direct ripio road to Tapi Aike, or the tarmac road which was effectively two sides of a triangle. It was a no brainer to take the quiet more direct ripio. The wind was not actually too bad, although the small sections when it was purely head wind were really draining. 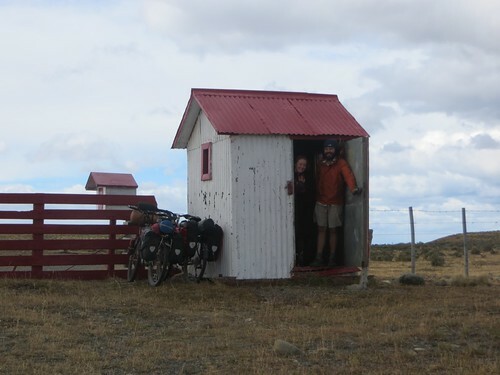 A police building marked the half way point of this 90km road, and was our target for the night. The police station was closed, but some local men fishing told us that the police man might be back that evening, we sat outside, made ‘hot choccy’ and waited…. …. we then gave up waiting, and Seth found us this place under a bridge. 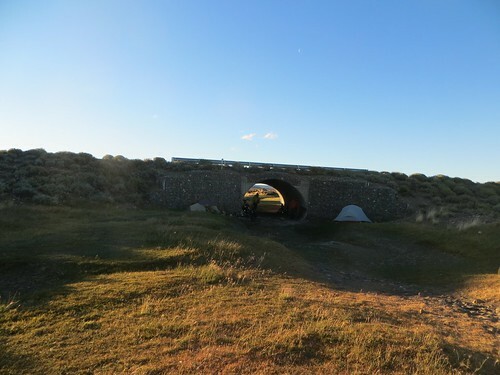 The side of the bridge actually offered the most protection, so this is where we camped. Over dinner we made the plan to rise early in an attempt to ‘beat the wind’ which seemed to be a lot stronger in the late morning and afternoon. Silhouetted Seth. 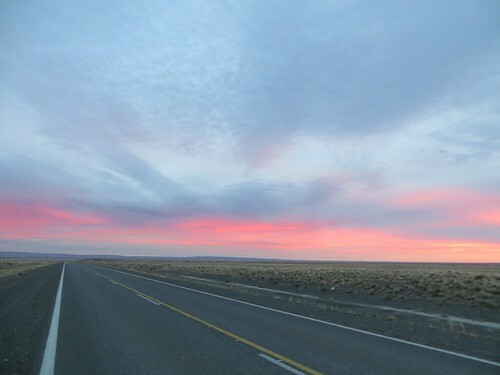 We are on the road by dusk at 6am. Without sun the air was cold, we were all wrapped up with our buffs and long gloves. As the morning progressed four of us rode in a pelaton, which we also referred to as ‘the pain train’, drafting, or slip streaming. This is when riders in a group save energy by riding in a line closely behind each other. The reduction in drag is noticeable. 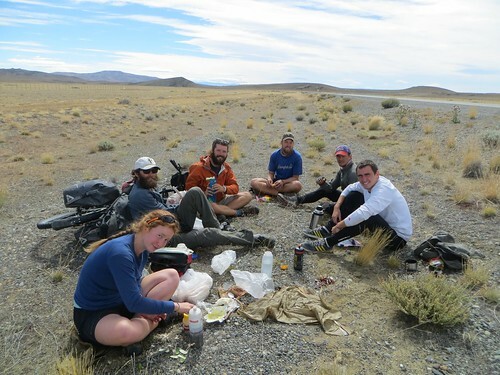 We decided to just stop for snack breaks, and eat lunch once we arrived in Tapi Aike. We stopped to wait for Matt, this coincided with the sun coming out, and hence playing Here Comes The Sun. When the wind was high I was primarily aware of the howling wind in my ears and working against the force of the wind, it was important to stop and appreciate the subtly beautiful scenes like these Ñandús on the pampa. In the late morning the wind really picked up, it was a relief when Tapi Aike came into view. 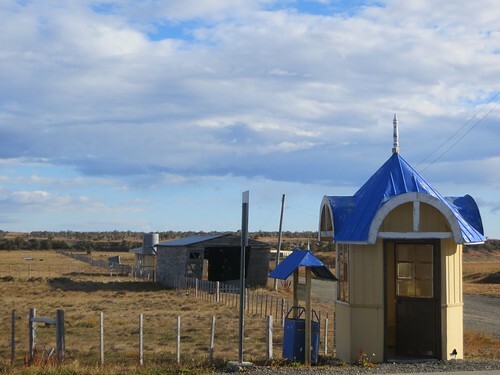 We had planned to spend the night in Tapi Aike, which consists of a police post, road maintenance point and a petrol station. We were told by the police to wait for the road maintenance guy to arrive and he would be able to give us a place to sleep in a trailer dormitory. 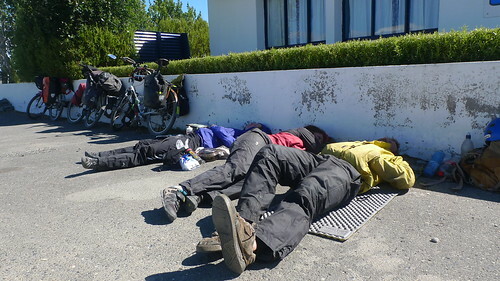 We ate some food and were shattered from our early rise, so some of us fell asleep in the sun for a couple of hours. 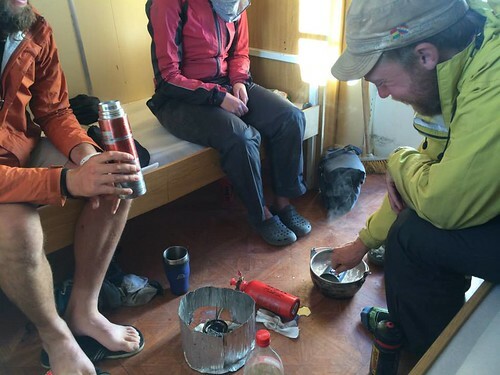 Once we got into the trailer we were able to make some hot choccy, and then cook food. That evening 7 more cyclists arrived, all of whom we knew. Again, we woke at 5am and were on the road at dusk, an hour later. I will never forget the pampa sunrises. 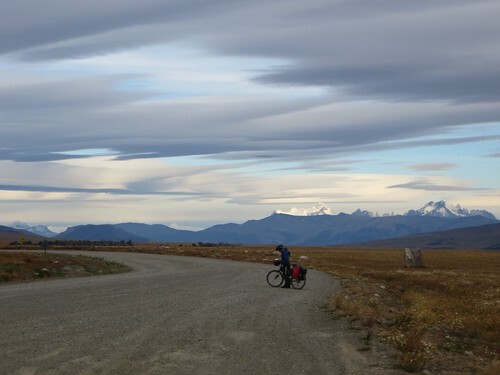 When riding the slipstream we were silent, each person would lead for as long as they wanted and then hold back and join the back of the pack when they were tired, taking a break when someone needed. 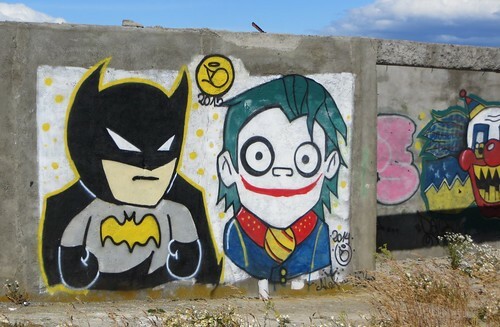 Power Rangers on the pampa. No filter or photoshop on those clouds. 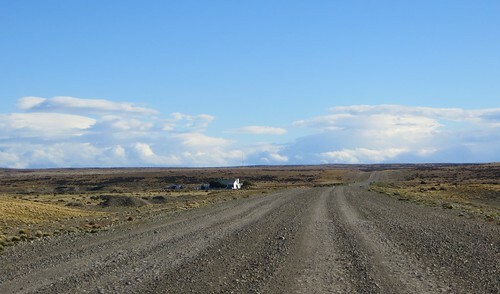 Some 25km down the road we turned off the asphalt and onto the ripio, making our way to the border. We stamped out of Argentina. Chilean immigration does not allow entry to the country with fresh foods (including dairy products). 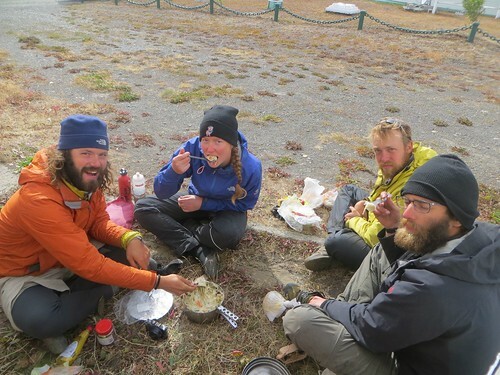 We therefore sat outside the Argentinian Gendemaria and cooked up an incredible meal of butter fried vegetables with the cheesiest of mash; it was a challenge for the boys to eat the stringy cheesy mash without getting it stuck in their beards. This was followed by butter and honey sauteed cinnamon apples. Paint stroke clouds. Full on cheesy mash we entered Chile for the final time. 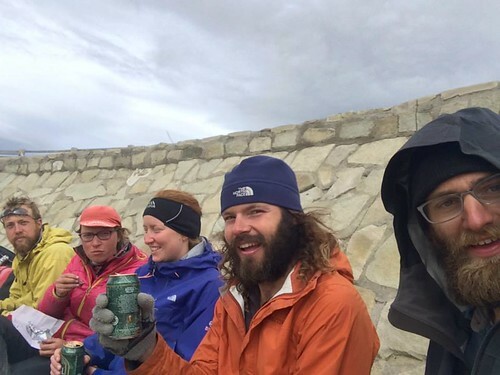 We stopped at the village of Cerro Castillo and drank a celebratory beer, before hitting the road again. 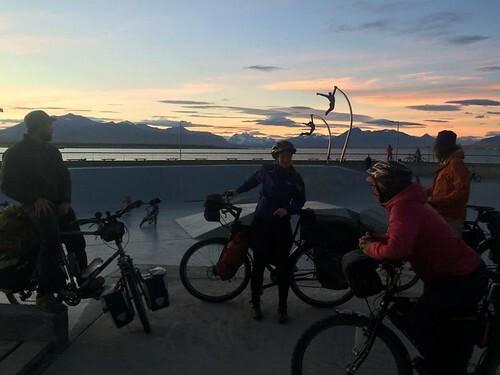 We cycled for a couple of hours more but the early mornings were beginning to catch up with us. 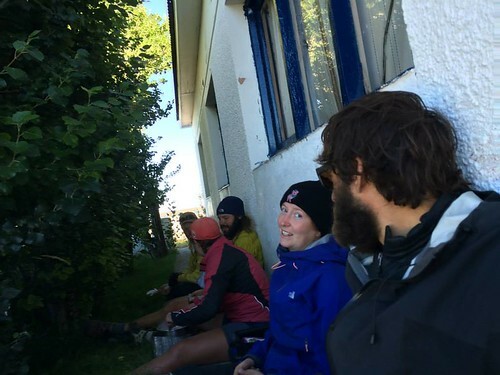 We stopped at a disused hotel that was being refurbished, the owner, a Frenchman called Domingo invited us to sleep on the floor of the hotel dining area. In this photo we were resting in the workmen’s kitchen. Boys choppin’ and sawin’ wood to the amusement of Domingo, and workers Jorge and Ernesto. That evening we sat around the fire in the hotel, drank hot choccy and chatted before having a huge, long sleep. Here we are with Domingo. 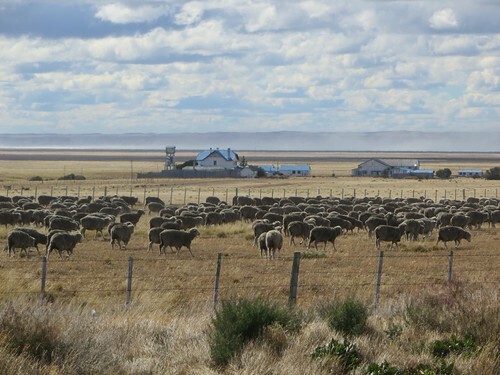 We had woken late and it was around mid day before we left Patagonia Inn. 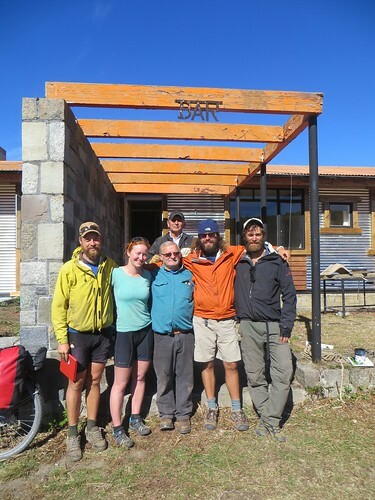 Ernesto, pictured at the back, invited us all to come and stay at his house in Puerto Natales. Charms kept an eye on the bikes whilst we went into tourist info. 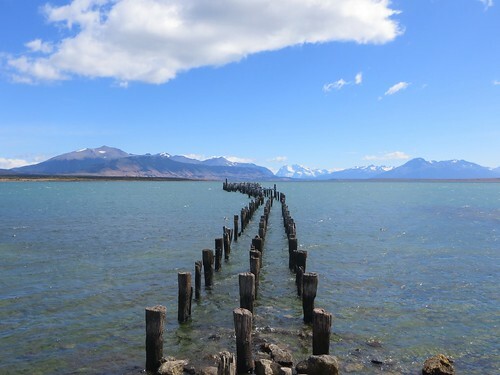 Having not been to a shop in 6 days it was easy to get carried away at the supermarket in Puerto Natales…. ….choco-milk and lemon pie all round. 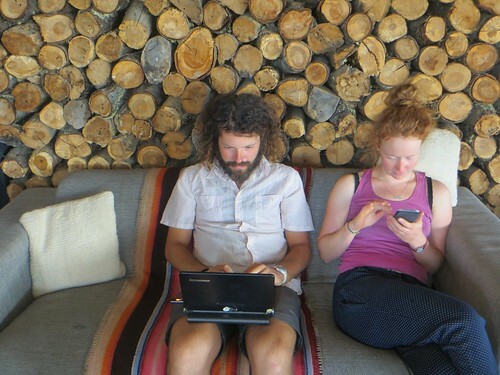 We hung around in a cafe most of the afternoon, as Ernesto did not finish work until 8. 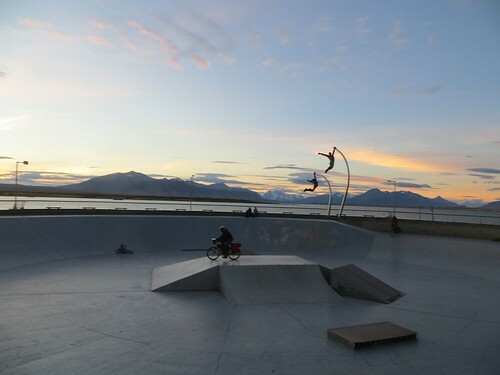 On our way to Ernesto’s house we had a go at the seafront skate park on our fully loaded bikes. Ernesto welcomed us, and told us this was our home. That evening we stayed up chatting with Ernesto and drinking wine. The following morning, Ernesto at work, we sat around the kitchen, chatted, and drank coffee for hours. We finally made it out of the house, mid afternoon. 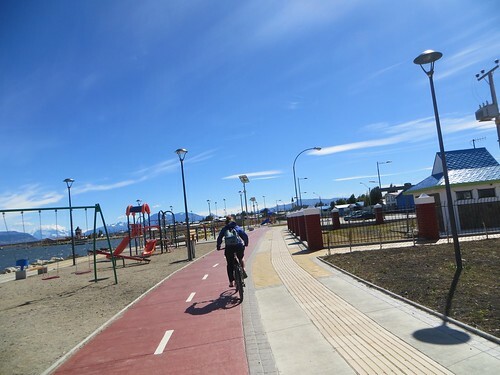 A lovely cycle path along the Puerto Natales sea front. I have no photos of the last evening we spent together. 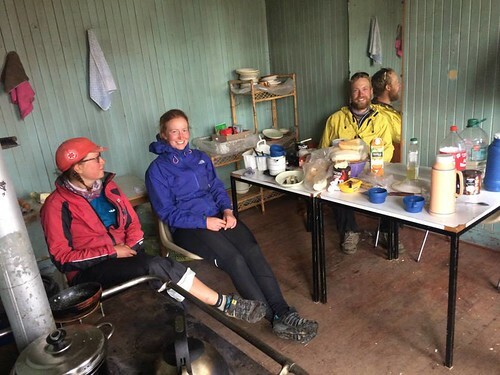 Seth and Matt were busy packing for their hike in Torres del Paine and the rest of us prepared a rich meal of creamy curry and banoffee pie. I am not into goodbyes so when Seth and Matt left the following morning I was busying myself in the kitchen. I recall a conversation with Seth the previous evening; having spent 6 weeks on the road, compared to my 21 months, he asked me if I was emotionally exhausted by meeting all these wonderful people that we share the road with, and who opened their homes to us, because of course the inevitable moment comes when it is time to say goodbye, and it’s tough and sad. At the time of the conversation I found it hard to think about the sadness of any of this, I have I loved and lived with so many incredible people and experienced such warm feelings (buena onda) that the biggest overwhelming feeling is one of gratitude. 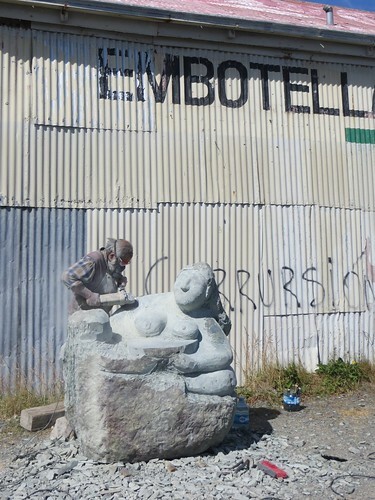 Puerto Natales is full of scuptures, we watched one being made. And then we were three. 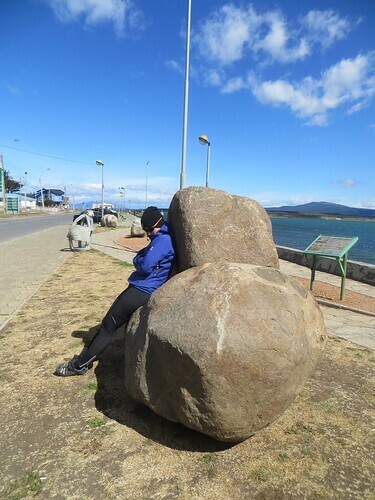 Charmian and I had plenty of time to spare so we decided to take another rest day in Puerto Natales, Lee had less time but was happy to stay. We spent the afternoon in the fancy cafe on the internet. 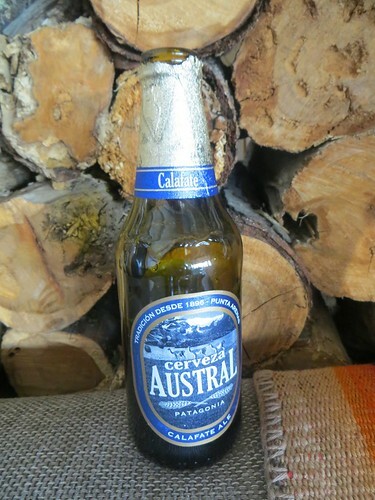 Beer was as cheap as a coffee, so it made sense to try out a local ale infused with calafate, the native Patagonian berry. 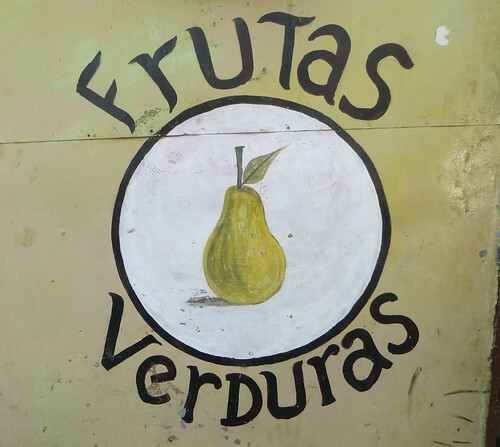 Fruit and Veg sign, Puerto Natales. Chilean has the highest incidences of violence against women in South America. This mural appeals to Chilean’s nationalism to promote women’s rights- it reads, when we [women] advance, Chile advances. 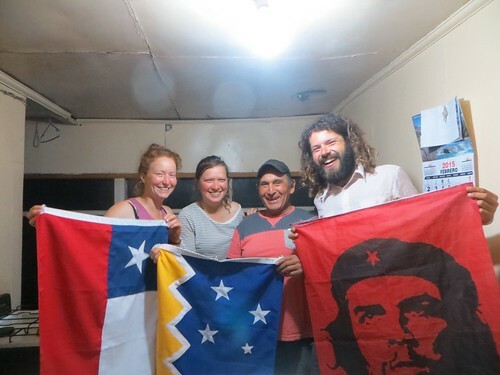 With three flags that Ernesto kept in his home; the Chilean flag, the flag for the Magellen and Antarctica region of Chile, and of course Che Guevara (because I am left wing, Ernesto told us). We were drinking wine and chatting all evening. Ernesto has a heart of gold and his messages of being kind to one another were very powerful. Such a special soul we are truly blessed to have met him. 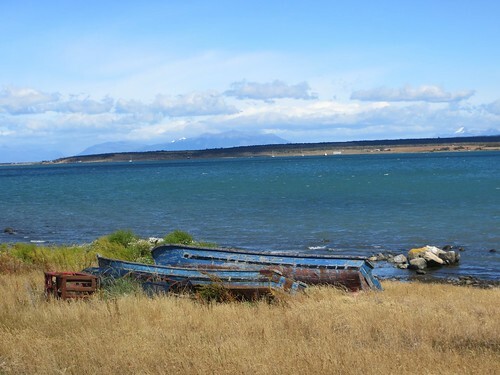 People from Southern Patagonia call themselves ‘Pinguinos’ (Penguins). We had really experienced some incredible Pinguino hospitality. Heading out of town we met Jorge and Farou, who we had met at Patagonia Inn a few days before. We were keen to get on the road but Farou insisted we have lunch at his house, this was giant plates of sausage and mash for the meat eaters and fried egg and mash (with additional fried egg sandwiches) for me, all washed down with fanta-chop, which is a drink of equal quantities beer and fanta, and tastes exactly like you’d imagine. After looking through various family albums we finally hit the road. 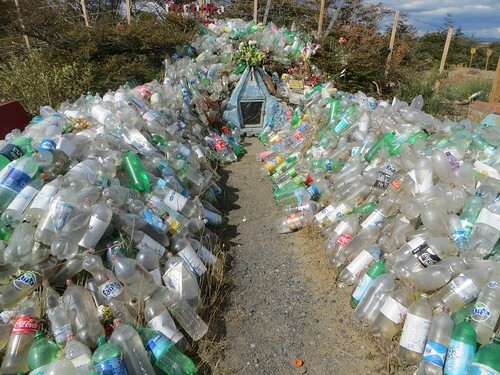 A huge Disfunta Correa shrine. I can’t say it was an exciting day of riding, but the wind was on our backs. 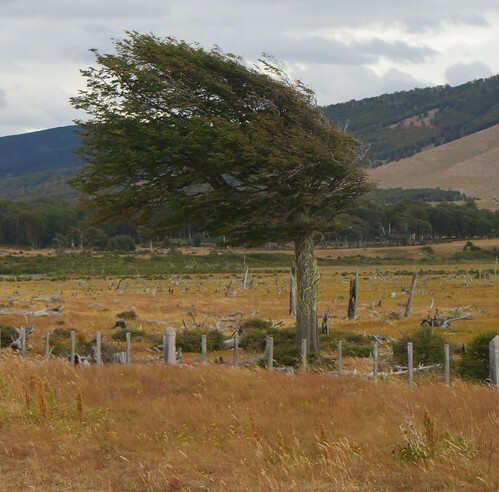 Typical wind swept Patagonian tree. 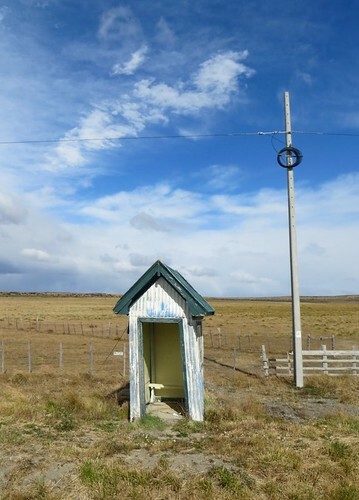 I was truly impressed by the volume of clean portable toilets we passed in the middle of nothing, between Puerto Natales and Punta Arenas. We arrived at the small settlement of Morro Chico in the fading sunlight. With good tail winds we had cycled 105km in half a day. 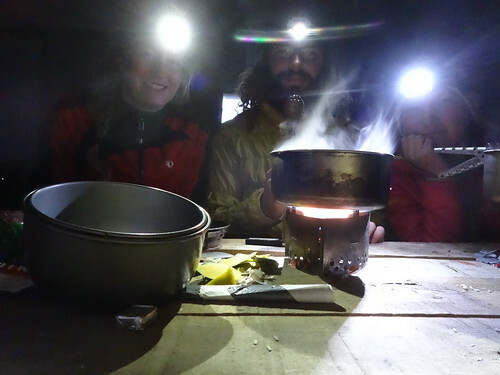 Here is the lamp crew cooking rice with squash and beetroot. 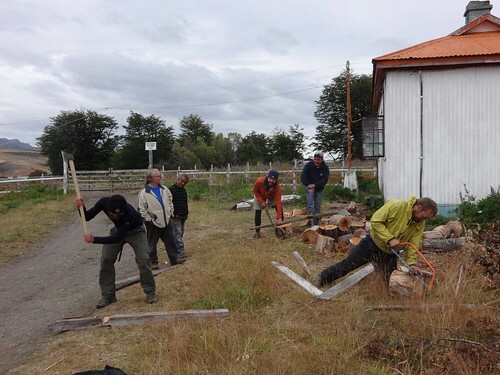 The carabineros told us to camp in an old barn opposite their station, instead we found a disused building next door and forced our way in, there was a section of clean floor for us to sleep and a table and bench for us to sit and cook, perfect. 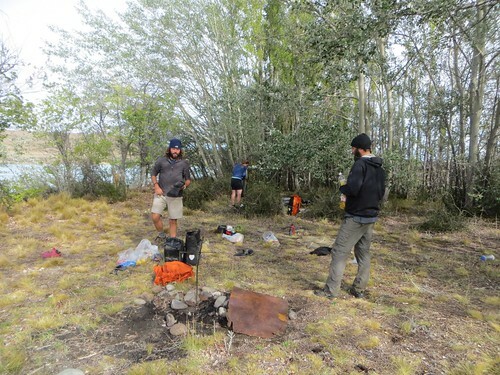 We stayed up late chatting, it was a really cold night, the first time in Patagonia I had to sleep in my thermals and jacket . The view from the police station. 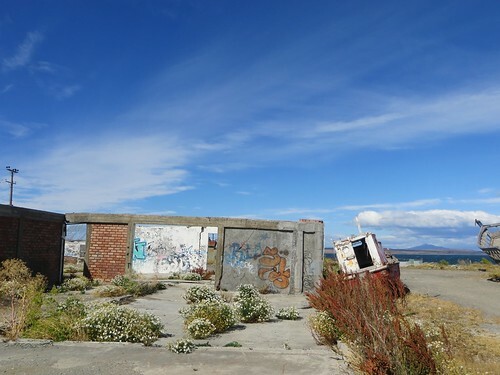 In the foreground you can see a typical Patagonian ‘castle’ style bus stop. In the background you can see the barn the police wanted us to sleep in, and then in the distance you can see a little water tower that was part of the building we slept in. 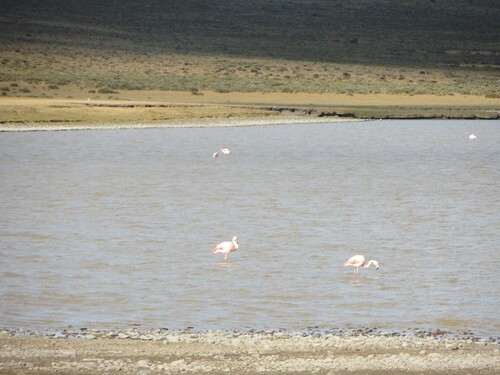 We almost didn’t stop to take a photo of these flamingoes, I then braked suddenly after thinking that this would have made us selfish brats, to take a view of flamingoes for granted. Rain clouds loomed above us. From here on in I will be talking a lot about estancias, this is one. 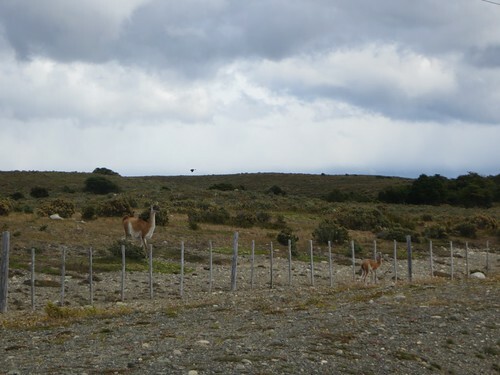 A baby guanaco that had been stuck the wrong side of the fence to his family, it was quite sad to watch him try and fail to get over the fence. 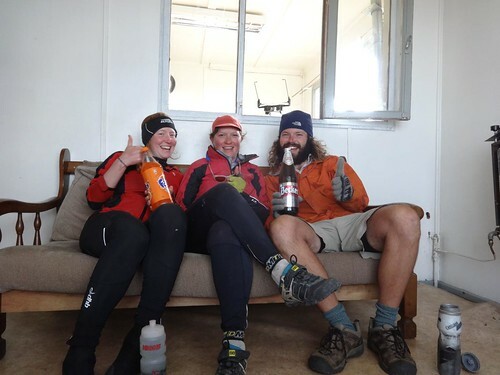 Lee and Charmian are faster than me, also, for me these pampa days were times of reflection and day dreaming, so I was always lagging behind. 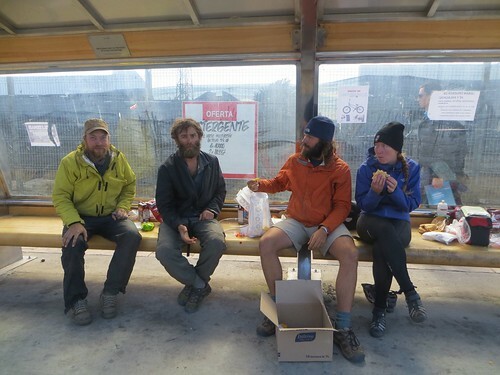 I caught up with them waiting for me in a bus shed. 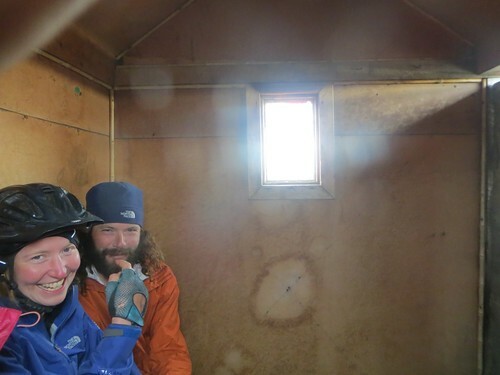 We stopped in the shed to eat our lunch, we were fortunate to have stopped when we did as a storm passed through, it was bitterly cold inside the shed but none of us wanted to go out into the storm to retrieve more clothing, instead we huddled together like penguins until we could leave. 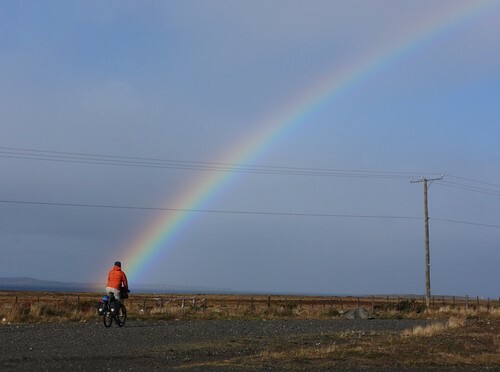 The rainbow after the storm, such sweet road gifts. 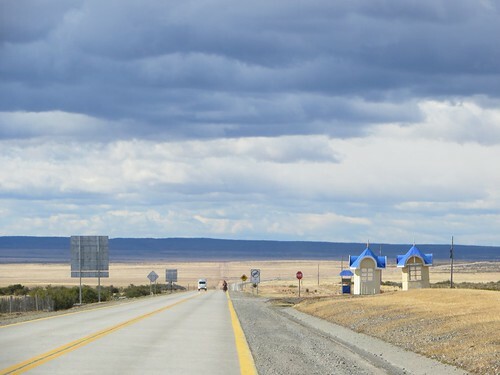 Farou had told us that he was driving to Punta Arenas that day, so it was not exactly a surprise to meet him on the road. What was a surprise was that he gifted us fanta and beer so that we could have a road side ‘fanta chop’. The police actually let us sit in their heated road side living room and drink beer; it was so hard to get back on the road. 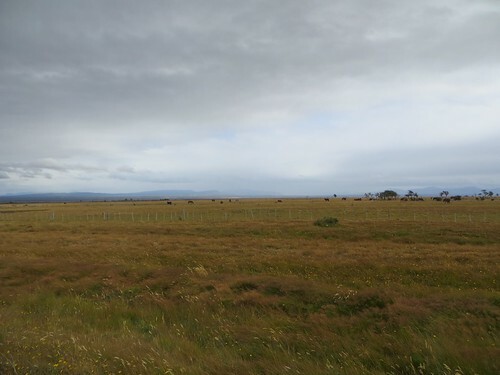 We declined a lift from Farou for the final 30km into Punta Arenas, a decision we soon regretted as the closer we got, the worse the traffic was. 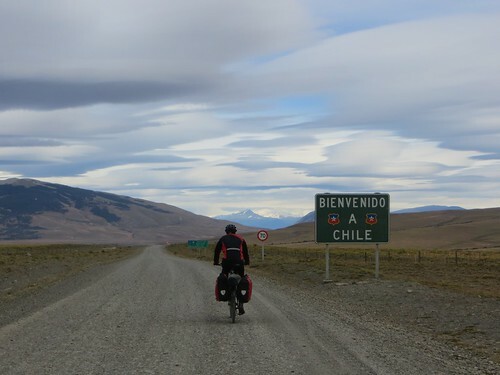 “At least we can say we cycled into the most Southern continental city in the Americas” I said during the worst of the traffic. That day we cycled a total of 150km. 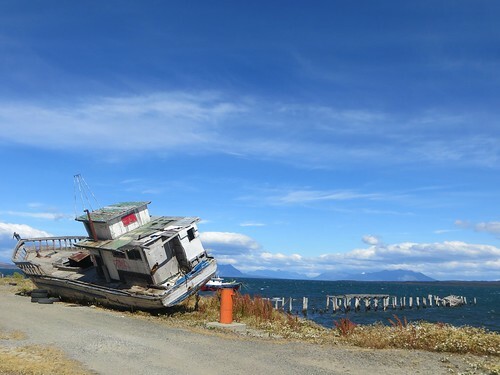 We were shattered and shivering on arrival in Punta Arenas and trumped for a cosy hostel (not pictured). That night we went over to another hostel to drink wine with Sarah and Scott of wander wheels fame, managed to convince Lee to take another day off, drank more wine, and ate nachos. Thank you Lee, Seth and Charms for letting me use some of your photos to better tell this story.